On the left side of the 'Home' screen there are 8 character slots, each of which is filled with a premade character. These characters can all be edited to look the way you want them to using the game's customisation options. If you tap the Slots+ button you will discover that there are an additional 12 slots for extra characters. 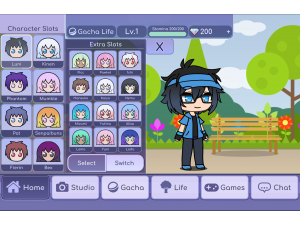 When you enter Studio or Skit Maker mode it will only be the characters occupying the first 8 slots that will be available to use. If you tap on any of the buttons on the right side of the 'Home' screen you will be able to access plenty of pages of character customisation options. Once you have made your selection there is no need to return to the 'Home' screen if you want to make changes to a different part of your character's body as this can be done by either tapping the arrow buttons or tapping the item itself to open up all the available designs. Once you are happy with how your character looks you just need to go to the 'Profile' section to set your character's name and other details associated with the character.